Though Maersk was not the specific target of the 2017 NotPetya ransomware attack, which hit a wide range of companies using the Ukrainian accounting software MeDoc via a malicious update, it didn’t much matter. The vast majority of the shipping giant’s systems crashed, compromising operations at ports and on vessels around the world over 10 days as the company scrambled to re-install their network. Maersk have since reported attack- related losses totalling a huge US$300m. Such a shocking incident has compelled the shipping industry to confront the neglected issue of cybercrime, and consider its readiness to prevent future attacks. Lagging behind the likes of aerospace and finance when it comes to cyber security preparedness, the industry recognised that it is something of a soft target. NotPetya may not have discriminated, but it still caused a huge amount of damage. What, then, would be the cost of a more targeted cyberattack? This is especially pertinent given that shipping has now entered the digital age, with so-called ‘smart’ vessels becoming increasingly connected, both in terms of on board systems and their links to shore-based service stations and third-parties offering remote performance monitoring and navigational assistance. Whilst cyber security technology has undoubtedly improved over recent years, the number of systems aboard a vessel that might be vulnerable to attack has proliferated, presenting hackers with far more opportunity to do damage. This will be further compounded by introducation of autonomous vessels in the coming years. DNV GL’s principal consultant of shipping advisory, Jan Hinnerk Haul, echoed this idea at an Immediasea cyber security round-table last month, suggesting that modern vessels are basically a “floating data center,” reliant on an array of both standard IT (information technology) systems and OT (operational technology) systems, such as navigational platforms and remotely-controlled valves and pumps. While a data breach in IT might risk a company’s finances and reputation, Haul noted that an attack on OT, which might mean overriding the ship’s navigational systems, or causing equipment to malfunction, poses far greater risks to life, property, and the environment. The quick-fix of updating cyber security software is only half the battle, as systems are compromised most often by the actions of untrained crew and seafarers who can introduce malware themselves through an act as simple as plugging their phone charger into a bridge USB port, or carelessly opening a phishing email. This can then play havoc with the interconnected systems on board the vessel. Ports and shore-based offices are also at risk from human cyber security negligence, and are arguably the more lucrative target. However, whilst training equips seafarers against cyberattacks, attempts to quantify the scale of the problem are hampered by shipowners’ tendency towards opacity when it comes to cybercrime. A scan of the news brings up few examples besides major stories such as Maersk and the Clarksons data breach in December. This can be attributed less to shipping’s immunity from cybercrime, though, and more to the tendency amongst shipping executives to keep news of cyberattacks out of the public sphere in order to protect their reputation and, by extension, profits. As an industry that relies on trust – to deliver goods safely, and on time – a breach of cyber security is potentially catastrophic for business, even if it is averted. It could also result in legal action by cargo owners and the need to complete extensive paperwork for law enforcement, creating further disincentives to reporting attacks. Secondly, as the EU’s GDPR (General Data ProtectionRegulation) is set to come into force in May this year, andthe IMO has announced that all shipowners will berequired to incorporate cyber security risk management into their vessels’ safety management as part of the ISM Code (audited by flag states), cyber security compliance has become essential in order to avoid harsh financial penalties and even vessel detainment. Thirdly, transparency around cyber security will allow classification societies to develop more relevant and effective cyber notations, which are likely to positively impact P&I insurance premiums by lowering the risk of certified Club members’ vessels. At present, P&I Clubs do not exclude liabilities to carriers and shipowners caused by cybercrime, but if the number of attacks rises as expected and shipowners cannot demonstrate some kind of compliance, the increased risk may force the Clubs to do so. As with many issues in shipping that require owners and operators to adjust their behaviour and commit funds, such as ballast water management, the sulphur cap, and the Hong Kong Convention, there will be those who delay action on cyber security, as well as plenty of doubters about the cyber threat. The newness of cybercrime and its complexity also mean many shippers find it difficult to understand. The IMO released MSC-FAL.1/Circ.3 Guidelines on maritime cyber risk management in July last year, marking the first significant global attempt to address the issue, but has not yet set out any regulations, which are likely to be goal-based if/when it does. The suggestion at the roundtable was that the class societies will take the lead on cyber security, with Bureau Veritas, Lloyd’s Register and the American Bureau of Shipping having released basic notations and China Classification Society a set of guidelines so far. DNV GL is also working on a set of class notations. These will give shipowners something concrete to work towards,and begin to generate a competitive advantage for those who achieve the notations. 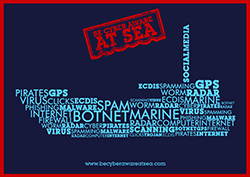 The growing commercial and institutional support given to initiatives such as the CSO Alliance and Be Cyber Aware at Sea that are trying to open up the conversation and, more importantly, are providing concrete training and reporting solutions, further suggests that shipping is finally starting to treat the cyber threat with the seriousness that it deserves. It may take another Maersk to truly convince the industry, but as the stakes get higher, the winners will be those who see cyber security as an investment rather than a tax – and take decisive action now instead of remedial action later.